Coral Sea (CVB-43) was launched 2 April 1946 by Newport News Shipbuilding and Drydock Co., Newport News, Va., sponsored by Mrs. T. C. Kinkaid, commissioned1 October 1947, Captain A. P. Storrs, III, in command; and reported to theAtlantic Fleet. Coral Sea sailed from Norfolk 7 June 1948 for a midshipmen cruise tothe Mediterranean and Caribbean, and returned to Norfolk 11 August. Afteroverhaul and training in the Caribbean, she sailed 3 May 1949 for her firsttour of duty in the Mediterranean with the 6th Fleet, returning 28 September.She returned to the Mediterranean for duty from 9 September 1950 to 1 February1951, bringing her impressive strength to the 6th Fleet in its importantrole as guardian of peace in the Mediterranean. An overhaul and local operations upon her return, as well as trainingwith Air Group 17, prepared her for a return to the Mediterranean once moreon 20 March 1951. As flagship for Commander, Carrier Division 6, she tookpart in a North Atlantic Treaty Organization exercise "Beehive I. "She returned to Norfolk 6 October for local and Caribbean operations, nextsailing for the Mediterranean 19 April 1952. While on service with the 6thFleet, she visited Yugoslavia, and carried Marshall Tito on a one-day cruiseto observe carrier operations. reclassified CVA-43 on 1 October 1952, shereturned to Norfolk for overhaul 12 October. Coral Sea trained pilots in carrier operations off the Virginia Capesand Mayport, Fla., and in April 1953 she embarked the Judiciary Committeeof the House of Representatives for a 3-day cruise. 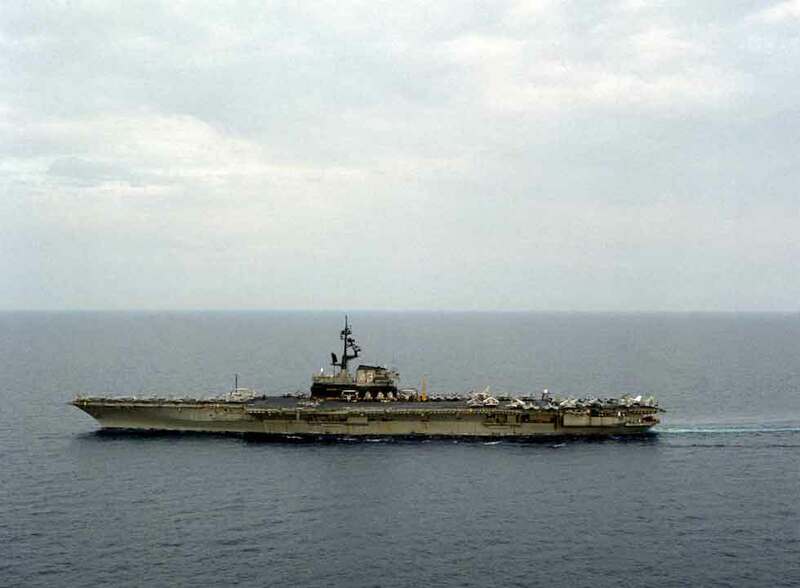 On 26 April the carrier sailed for a tour of duty in the Mediterranean. This cruise was highlightedby a visit to Spain, and participation in NATO exercise "Black Wave"with Deputy Secretary of Defense R. M. Kyes on board as an observer. Returningto Norfolk 21 October, she carried out tests for the Bureau of Aeronauticsand trained members of the Naval Reserve at Mayport, Fla., and GuantanamoBay. Coral Sea returned to the Mediterranean from 7 July to 20 December 1954,and during this tour was visited by Generalissimo Franco as she lay offyalencia, Spain. On her next tour of duty in the Mediterranean from 23 Marchto 29 September 1955, she called at Istanbul, and participated in NATO exercises. Sailing from Norfolk 23 July 1956 for Mayport to embark Carrier Air Group10, Coral Sea continued on to the Mediterranean on her next tour. She participatedin NATO exercises, and received the King and Queen of Greece on board asvisitors in October. During the Suez Crisis, she evacuated American citizensfrom the troubled area, and stood by off Egypt until November. She returned to Norfolk 11 February 1957. She cleared that port on 26 February and visitedSantos, Brazil; Valparaiso, Chile; and Balboa, C.Z., before arriving atBremerton, Washington, 15 April. Coral Sea was decommissioned for conversion24 May 1957, and upon completion was recommissioned 25 January 1960 to rejointhe Fleet. During September 1960, she conducted training with her new air group along the west coast, then sailed in September for a tour of dutywith the 7th Fleet in the Far East.